I have a lot of crap. I am not good at throwing away crap. There, I've said it, but fortunately I have an opportunity for redemption with the new shop. 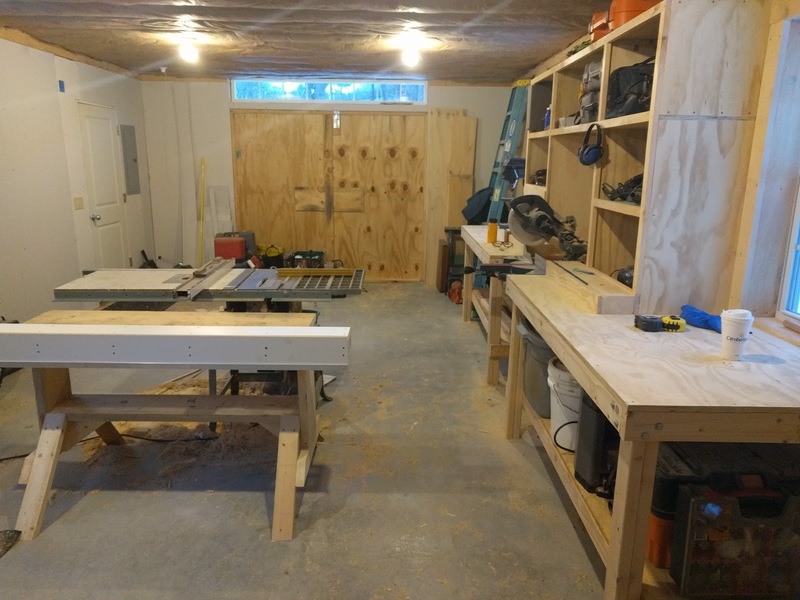 My old shop (in my basement) was less than half the size of the new space, but it was filled up with 10 years worth of scrap wood, various nuts and bolts and other assorted debris that I was reluctant to throw away because "it might just come in handy someday". As it turns out, I really don't need that dishwasher motor, or the bag of 17/32 bi-metal washers, or really any of the odd collection of junk for that matter. I guess that goes back to the days when I didn't have 2 cents to rub together and spending $3 on some washer was really extravagant. So a lot of it is getting purged as I move everything over to the new space so I can start collecting a fresh pile o' crap. ed tool bag that will stay over at the house for day to day "operations". 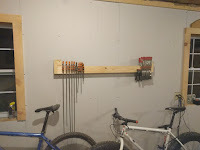 I put up some pegboard along the back wall to store all the frequently used hand tools like saws, mallets, and screwdrivers and have found cubby homes for all the power tools at the miter saw station. 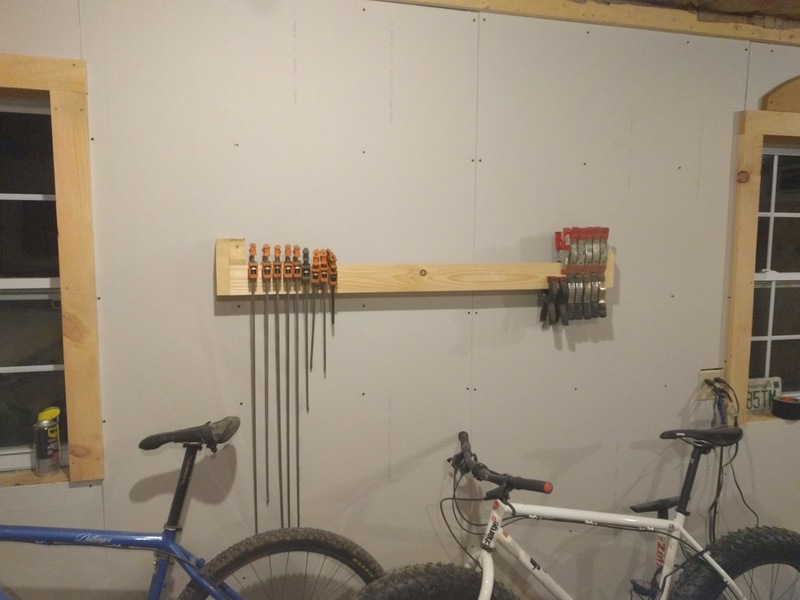 I also set aside a full drawer for drill bits, hole saws, and and bit mounted wire wheels, but I haven't come up with a good arrangement for the myriad of good fasteners I have, but will probably settle for a plastic case with sufficient storage. 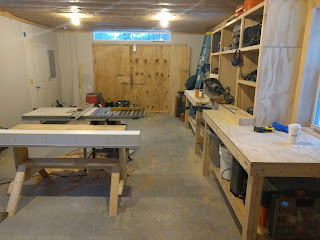 I still need to move the compressor and the band saw over, but given the snow and ice we have right now outside the old shop door, it would be pretty treacherous to try and move them and will have to wait until it's not so slippery. With any luck, I'll be able to start on boaty stuff in the next week or so; The first task I'm going to do on the Campion Apple build is to build the birdsmouth mast, and I hope to get the wood (either Sitka Spruce or Douglas Fir depending on price and quality) over the weekend. You are getting things ready! I found your blog. When you make the mast, don't taper it except at the top, above the position of the yard. You want it to be totally stiff. The yard though needs a little bit of flexibility to spill gusts. Think of the yard and mast and luff as one leading edge with the yard as a bendy topmast. Make sure that it is long enough to raise the mainsail high enough to easily get under the boom and catch light air. You can lower it a lot before reefing. I reef just by dropping the whole sail into the boat, pulling on the slab reefing lines and cleating them and then raising the sail. I could not find the building photos. Must have accidentally erased them when moving the folder. I found a few more of the boat and interior which I will put on Dropbox soon. I am not thrilled with the split tiller. Despite it being hollow (carbon over corrugated cardboard mold), it swings around due to the long leverage arm and its weight when the boat heels when I am not holding it. I would think about a "Norwegian" push-pull tiller arm. Is this the best place to discuss your building? 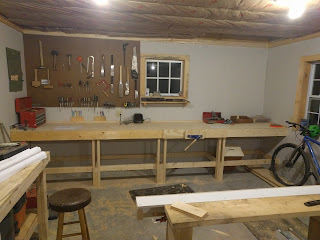 I'm glad you mention the mast taper now, because I just got back from the shop marking the taper and setting up the staves for cutting had just done a few passes with the jointer plane so I haven't gotten too far yet. I will adjust the taper further up the mast. It saves some work for me too, so I like it. As far as the tiller goes, that was one of the first questions I asked Tom when I bought the plans. I've sailed a Caledonia Yawl and loved the push-pull tiller on it. I am planning on implementing the same on the Apple. Thanks for all the feedback and feel free to point out where I am going wrong if you see something. I will be documenting my progress here as much as possible.